Queensbury is a town in Warren County, New York, United States. The population was 27,901 at the 2010 census. It contains the county seat of Warren County, located at a municipal center complex on U.S. Route 9 south of the village of Lake George. It was moved to the complex in 1963 from the original county seat of Lake George. The town is located in the southeastern corner of the county and is part of the Glens Falls Metropolitan Statistical Area. It is named in honor of Queen Charlotte, the consort of George III of Great Britain and Ireland. Although primarily located north of the city of Glens Falls, Queensbury surrounds the city on three sides. The Great Escape & Splashwater Kingdom, a Six Flags theme park, is located in northwest Queensbury. West Mountain, a downhill skiing area, is located in the southwestern part of town. Major efforts at settlement began with the Queensbury Patent in 1762, which enticed Quaker settlers to move into the area known as the "Township of Queensbury" the next year. The Quakers left during the Revolutionary War and returned in 1783 when hostilities ended in the area. In 1786, the town was re-established as the town of Queensbury. In 1788, the town included all of what is today Warren County. It lost territory in 1792 when the town of Fairfield (Lake Luzerne) was formed and again in 1810 to form part of the town of Caldwell (Lake George). In 1908, the then largest village within Queensbury, Glens Falls, incorporated as a city and became a separate municipality. The population of Queensbury has exceeded that of Glens Falls since the 1980 Census. In 2003, with permission from Queensbury, Glens Falls annexed approximately 49 acres (0.20 km2) of the town. The land, known as Veterans Field or the Northway Industrial Park, is on Veterans Road between Luzerne Road and Sherman Avenue and is just east of I-87. The land was vacant at the time. A thin, 0.5 miles (0.80 km) strip of Sherman Avenue was part of this annexation, in order to comply with state law regarding contiguity of annexed land. Both the city and town now share ownership of this stretch of highway as a result. The Sanford House and Asa Stower House are listed on the National Register of Historic Places. According to the United States Census Bureau, the town has a total area of 64.81 square miles (167.9 km2), of which 63.01 square miles (163.2 km2) is land and 1.80 square miles (4.7 km2) (2.78%) is water. The west town line is the border with the town of Lake Luzerne. The south town line is defined by the border with the city of Glens Falls and the Hudson River, across which lies Saratoga County, New York. The east town line is the border of Washington County, also New York State. 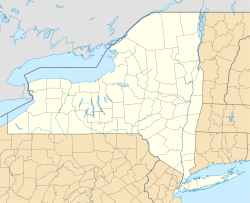 The northern border is defined by the town of Lake George and, according to the town and Warren County, by the shoreline of the body of water, Lake George, itself. However, several maps, including those published by the USGS depict the northern boundary as including part of the lake, including Speaker Heck Island and Happy Family Islands. Parts of western and northern Queensbury are within the Adirondack Park. As of the census of 2000, there were 25,441 people, 9,948 households, and 7,162 families residing in the town. The population density was 403.8 people per square mile (155.9/km²). There were 11,223 housing units at an average density of 178.1 per square mile (68.8/km²). The racial makeup of the town was 97.54% White, 0.55% African American, 0.20% Native American, 0.71% Asian, 0.02% Pacific Islander, 0.22% from other races, and 0.76% from two or more races. Hispanic or Latino of any race were 1.12% of the population. There were 9,948 households out of which 34.0% had children under the age of 18 living with them, 59.1% were married couples living together, 9.4% had a female householder with no husband present, and 28.0% were non-families. 22.6% of all households were made up of individuals and 11.0% had someone living alone who was 65 years of age or older. The average household size was 2.52 and the average family size was 2.97. In the town, the population was spread out with 25.3% under the age of 18, 6.1% from 18 to 24, 28.3% from 25 to 44, 25.1% from 45 to 64, and 15.2% who were 65 years of age or older. The median age was 39 years. For every 100 females, there were 92.2 males. For every 100 females age 18 and over, there were 89.4 males. The median income for a household in the town was $47,225, and the median income for a family was $54,880. Males had a median income of $39,260 versus $25,036 for females. The per capita income for the town was $24,096. About 3.8% of families and 5.0% of the population were below the poverty line, including 7.4% of those under age 18 and 2.2% of those age 65 or over. Queensbury is a town of the first class, and as such has a town board with a town supervisor and four councilmen. Town residents petitioned to establish a ward system in 1981 and again in 1985 whereby the town would be divided into four wards. In a ward system, whereas the supervisor is elected by the entire town electorate, each councilman is elected by only the electorate of the ward he or she will be representing. Having been approved by the voters by referendum in 1985, the first town board to be elected under the ward system convened in 1986. 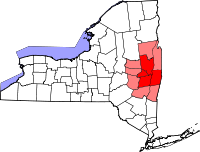 Queensbury is one of only ten towns out of New York's 932 towns that had a ward system as of 2000. The town has an ethics board, planning board, and zoning board of appeals. In county government, Queensbury is entitled to five of the 20 seats on the Warren County Board of Supervisors. (Glens Falls also gets five seats, whereas the remaining ten towns in the county receive one seat each.) Four of Queensbury's seats are filled by town-wide election, whereas the fifth is reserved for the town supervisor. Emergency services can be accessed by dialing 9-1-1, which routes calls to Warren County's 911 Communications Center. Law enforcement and other police services are provided by the Warren County Sheriff's Office and are supplemented by the New York State Police, which maintains a barracks in the town. Queensbury has not had its own police force since disbanding it in 1982. The town is divided into five fire protection districts: Bay Ridge, North Queensbury, Queensbury Central, South Queensbury, and West Glens Falls. Each district contains at least one fire station, with Queensbury Central and West Glens Falls each having two stations. Three emergency medical services (EMS) districts provide out-of-hospital acute care and ambulance services: Bay Ridge EMS, North Queensbury EMS, and West Glens Falls EMS. A State Emergency Management Office (SEMO) regional office is located on Fox Farm Road. Queensbury was the home of the Lake George Opera Festival from 1965 to 1998. During this period, the festival was held in the 875-seat Queensbury High School auditorium, producing three to seven operas per year. SUNY Adirondack – a part of the SUNY system. Brendan Harris – professional baseball infielder for the Chicago Cubs, Montreal Expos, Tampa Bay Devil Rays, Washington Nationals, Minnesota Twins, Cincinnati Reds, Los Angeles Angels and Baltimore Orioles; grew up in Queensbury. Solomon Northup – American abolitionist and the primary author of the memoir Twelve Years a Slave. He lived with his daughter Margaret Stanton and her family in Queensbury by 1855. Johnny Podres (1932–2008) – former MLB Pitcher with the Brooklyn Dodgers/Los Angeles Dodgers, Detroit Tigers & San Diego Padres from 1953–69; lived in Queensbury following his baseball career. Derek Richardson – Hollywood and TV actor known for roles in Dumb and Dumberer: When Harry Met Lloyd & Hostel; born and raised in Queensbury. Joe Sylvester (1893–1976) – served as the first golf professional at the Glens Falls Country Club in 1914. Adam Terry – professional football lineman for the Tennessee Titans, Jacksonville Jaguars, San Diego Chargers, Indianapolis Colts, & Baltimore Ravens; grew up in Queensbury, where he played high school football. Aviation Mall – shopping center on Aviation Road. Brayton – A hamlet in the northeastern part of town. East Lake George – A hamlet in the northern part of the town and including part of the town of Fort Ann, located in Washington County. The hamlet attempted to incorporate as a village, a measure rejected by voters in 2010. Floyd Bennett Memorial Airport (GFL) – An airport, formerly known as the Warren County Airport, in the southeastern part of the town. French Mountain – A hamlet northwest of Glen Lake that shares its name with the mountain to its northeast. Glen Lake – A hamlet and lake north of Glens Falls North. Glens Falls North – a census-designated place along the northern borders of Glens Falls and West Glens Falls. The Great Escape & Splashwater Kingdom – Six Flags affiliated amusement park located in Queensbury; opened 1954 as Storytown, U.S.A.
Harrisena – A hamlet roughly following State Route 9L in the northern section of the town which borders Lake George. Granted to American Revolutionary War spy Moses Harris for his service in the war. Kattskill Bay – A hamlet in the northeastern-most area of the town. Lake Sunnyside – A small lake and hamlet in the east-central portion of the town. Oneida Corners – A hamlet at the modern junction of Sunnyside Road and State Route 9L. Paradise Beach – A hamlet in the vicinity of The Great Escape and Round Pond on County Route 17. Queensbury – A hamlet located in the east part of the town near the Queensbury-Kingsbury-Fort Ann town lines. West Glens Falls – A hamlet and census-designated place bordering the west side of the city of Glens Falls. ^ a b c "Town Government". Town of Queensbury. Archived from the original on 2009-03-24. Retrieved 2009-03-12. ^ a b c d e f g "American FactFinder". United States Census Bureau. Retrieved 2008-01-31. ^ "Karner Blue Butterfly". Town of Queensbury. April 23, 2001. Archived from the original on April 30, 2010. Retrieved August 4, 2010. ^ "Find a County". National Association of Counties. Archived from the original on August 4, 2010. Retrieved August 9, 2010. ^ Google Maps (1340 U.S. Route 9, Lake George, New York), Retrieved Jan. 14, 2015. ^ PostStar, Lake George Officials Consider New Use For Old Courthouse; retrieved January 14, 2015. ^ VanDyke, Marilyn. "Brief History of Queensbury, NY". Historian, Town of Queensbury. Archived from the original on 2008-07-04. Retrieved 2009-03-18. ^ a b "Recreational Opportunities" (PDF). Department of Community Development, Town of Queensbury. Archived from the original (PDF) on 2010-11-28. Retrieved 2009-04-23. ^ a b c d e f g VanDyke, Marilyn. "Oneida Hamlet". Archived from the original on May 8, 2009. Retrieved 2009-03-17. ^ Bridging The Years: Glens Falls, New York 1763-1978. Glens Falls, NY: Glens Falls Historical Association. 1978. ISBN 0-8081-3885-5. ^ a b c d "1990 Census of Population and Housing" (PDF). Bureau of the Census. p. 526/PDF p. 538 (Table 45). Retrieved 2010-07-12. ^ Overview of 2003 Annexation (Map). Cartography by NAVTEQ. Yahoo! Inc. Retrieved February 27, 2011. ^ "New York by Place and County Subdivision". American FactFinder. Retrieved 2009-04-10. ^ a b c Town of Queensbury (PDF) (Map). Town of Queensbury Community Development Department. April 2004. Archived from the original (PDF) on November 28, 2010. Retrieved February 27, 2011. ^ "Full Environmental Assessment Form" (PDF). Town of Queensbury. March 14, 2003. p. 5. Archived from the original (PDF) on December 21, 2010. Retrieved February 27, 2011. ^ Warren County Spatial Data Viewer (Map). Warren County GIS. Archived from the original on August 17, 2011. Retrieved February 27, 2011. ^ a b Lake George Digital Raster Quadrangle (Map). 1:24,000. New York State Department of Transportation. 1992. Retrieved January 22, 2010. ^ "First Census of the United States:Summary of population by counties and towns" (PDF). United States Census Bureau. 1790. p. 8. Retrieved August 23, 2010. ^ "Return of the Whole Number of Persons within the Several Districts of the United States" (PDF). United States Census Bureau. 1800. p. 31 (PDF 33). Retrieved August 23, 2010. ^ "(Census 1820)" (PDF). United States Census Bureau. 1820. p. 59 (PDF 46). Retrieved August 23, 2010. ^ a b c "Ninth Census - Volume I: The Statistics of the Population of the United States" (PDF). United States Census Bureau. 1872. p. 219 (PDF 13). Retrieved August 23, 2010. ^ "Statistics of the Population of the United States at the Tenth Census" (PDF). United States Census Bureau. 1882. p. 217 (PDF 39). Retrieved August 23, 2010. ^ "Population of the United States at the Eleventh Census: 1890" (PDF). United States Census Bureau. 1895. p. 252 (PDF 42). Retrieved August 23, 2010. ^ a b "THIRTEENTH CENSUS OF THE UNITED STATES: 1910 – V~3 POPULATION" (PDF). United States Census Bureau. 1913. p. 205 (PDF 48). Retrieved August 23, 2010. ^ "Twelfth Census of the United States – 1900 - Census Reports Volume I – Population Part I" (PDF). United States Census Bureau. 1901. p. 285 (PDF 93). Retrieved August 23, 2010. ^ "Fifteenth Census of the United States – 1930 – Population - Volume III, Part 2: Montana-Wyoming" (PDF). United States Census Bureau. 1932. p. 322 (PDF 169). Retrieved August 23, 2010. ^ a b c "Census of Population: 1960 - Volume 1 Part 34" (PDF). United States Census Bureau. 1961. pp. 34–20 (PDF 21). Retrieved August 23, 2010. ^ "Boards and Committees - Town of Queensbury". Town of Queensbury. Archived from the original on 2009-08-01. Retrieved 2017-12-05. ^ "Board of Supervisors". Warren County. Archived from the original on 2010-07-19. Retrieved 2010-07-11. ^ a b "Warren County Sheriff's Office". Warren County Sheriff's Office. Archived from the original on 2008-03-21. Retrieved 2010-07-11. ^ "Contact Troop G". New York State Police. Retrieved 2010-07-11. ^ "Town of Queensbury, NY - Town Code -- Chapter 32: Police Department". General Code. Retrieved 2017-12-05. ^ Fire Protection Districts (PDF) (Map). Town of Queensbury Community Development Department. Archived from the original (PDF) on 2010-05-09. Retrieved 2010-07-11. ^ Emergency Response Districts (PDF) (Map). Town of Queensbury Community Development Department. Archived from the original (PDF) on 2010-05-09. Retrieved 2010-07-11. ^ Bramen, Lisa (2005-08-10). "If disaster strikes, SEMO's ready". The Post Star. Retrieved 2010-07-11. ^ "(Map of Queensbury School Districts)" (PDF). Town of Queensbury Community Development Department. Archived from the original (PDF) on 2011-06-09. Retrieved 2009-03-15. ^ "SUNY: Complete Campus List". The State University of New York. Retrieved 2009-03-15. ^ "Brendan Harris Statistics & History". Sports Reference LLC. Retrieved March 24, 2011. ^ "Johnny Podres Statistics and History". Sports Reference LLC. Retrieved March 28, 2011. ^ Goldstein, Richard (January 14, 2008). "Johnny Podres, Series Star, Dies at 75". The New York Times. Retrieved March 28, 2011. ^ "Derek Richardson profile". IMDb.com. Retrieved March 24, 2011. ^ "Derek Richardson profile". ABC Medianet. Archived from the original on January 22, 2007. Retrieved December 25, 2015. ^ "Adam Terry Stats". ESPN Internet Ventures. Retrieved October 4, 2011. ^ Roman, Dayelin (August 26, 2010). "East Lake George proposal is defeated". The Post-Star. Retrieved August 27, 2010. ^ a b Warren County; Glens Falls Queensbury Lake George; New York State (Map) (8th ed.). JIMAPCO, Inc. 1996. ^ a b "Urbanized Area Outline Map (Census 2000); Glens Falls, NY" (PDF). U.S. Census Bureau. Retrieved 2009-05-13. ^ Glens Falls Digital Raster Quadrangle (Map). 1:24,000. New York State Department of Transportation. 1991. Retrieved January 22, 2010. ^ Hudson Falls Digital Raster Quadrangle (Map). 1:24,000. New York State Department of Transportation. 1992. Retrieved January 22, 2010. ^ MAP OF WARREN Co NEW YORK (Map) (1858 ed.). E.A. Balch & W.O. Shearer. Archived from the original on 2010-12-05. Retrieved 2010-01-16.